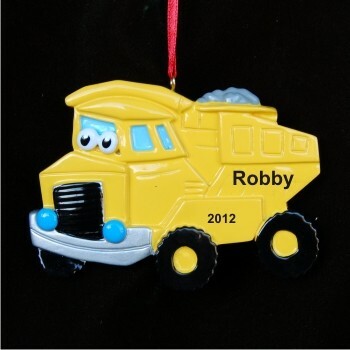 Looking like its straight out of a favorite book or cartoon, the very cute dumptruck boy personalized Christmas ornament will put a smile on a little guy's face now and be a cherished keepsake of childhood in the years ahead. We add a name and the year to these kids ornaments for the recipient, and they arrive in our custom velvet drawstring pouch with a display cord already attached. The yellow dump truck personalized Christmas ornament makes a fun stand-alone gift, and some parents use it as a present topper when giving their child a real toy dump truck for a birthday or the holidays.